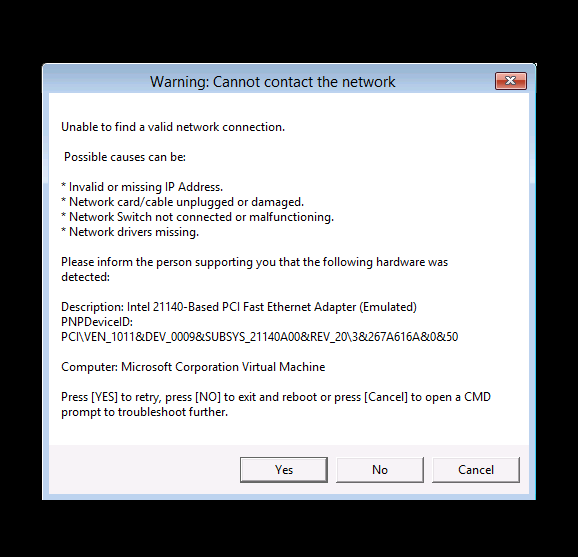 In a previous post I showed you how you can check for network connectivity before starting a task sequence in Configuration Manager 2012 R2. In this post I'll add a newer script to also check for storage (SAS, SATA, SCSI, Storage). The added code gives you new abilities to deal with hardware that has changed for whatever reason and it allows you to quickly identify the problem, and identify the storage vendor id and device id so that you can go looking for drivers. As storage is a must (the task sequence must write temp files on your hard disc and also copy packages) adding this change to the script was inevitable. I hope you like the results. simply replace the earlier script with this one as documented in the process detailed here. After implementing the new script in your boot image this is what you'll see when it detects missing storage drivers. Can this same solution be implemented within MDT? I'm assuming so but don't know if it is just an edit of the LiteTouch WIM file or if there would have to be other steps as well. quick question before how would it reacts if it's a standalone image? so I've implemented the script in an MDT 2013 update 2 boot image (integrated with sccm) , works great, detects when no network or when no disk, really really usefull, should be included by default Niall, thanks a lot for putting this together and sharing it! Now... i'm sometimes using a standalone image, using the same boot image, is there a way in the script to detect it (or prestaged media) and bypass the network detection in this case? can you expand on this please ? well in a standalone image you don't need network connectivity to run the task sequence right? you can just run it from an usb key. But it's still using the boot image to boot in winPE at the beginning, so if we have a script asking for network in the boot image without any way to ignore it the task sequence can't start. 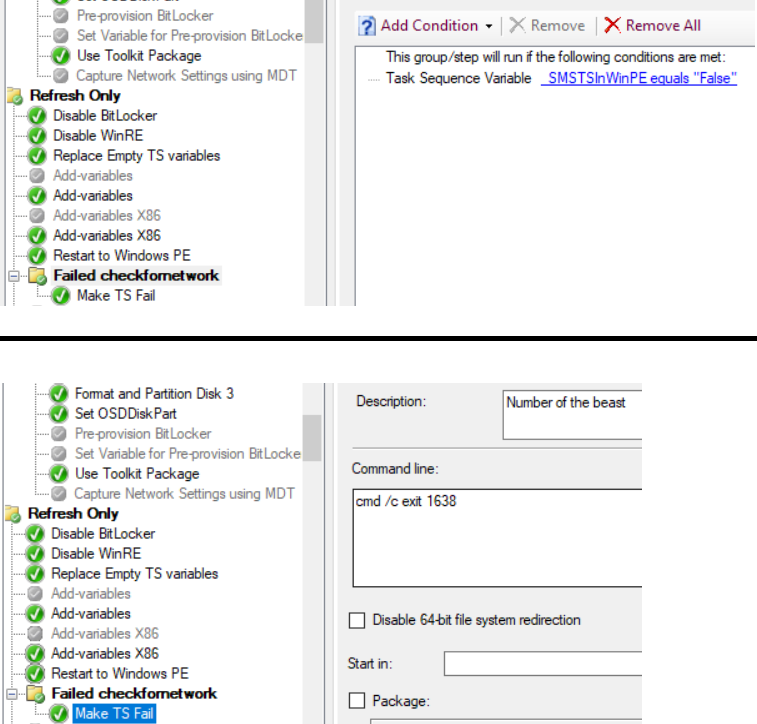 SMS - specifies that the task sequence is started by using the Configuration Manager client. UFD - specifies that the task sequence is started by using USB media and that the USB media was created in Windows XP/2003. UFD+FORMAT - specifies that the task sequence is started by using USB media and that the USB media was created in Windows Vista or later. CD - specifies that the task sequence is started by using a CD. DVD - specifies that the task sequence is started by using a DVD. PXE - specifies that the task sequence is started from PXE. HD – specifies that the task sequence was started from a hard disk (prestaged media only). Any comments as to SCCM CB compatibility? I've implemented this in SCCM CB 1702 using a copy of our standard Win10 1607 boot image. It looks like the script is running and immediately exiting, and WinPE then immediately reboots, presumably because that's how WinPE seems to behave when there is nothing left to run. Good to know. And good point. The only change I made was the edit of the IPs to check, but I probably got a little ambitious by replacing the IPs with a DNS hostname. I'll try swapping it out with the IP. Edit: Actually it looks like I messed up the wim injection. Disregard! Fix for bootloops when a TS is initiated from Software Center and the script is detecting failures during the checks. This will also cause the TS to continue in the full OS. The start cmd part is good but it's a LPE-exploit waiting to happen. All you have to do is start a TS from SC and then pull the cable and you're 'local system'. Don't bind it to cancel since the x in the corner returns the same thing. Detect if "command support" is enabled on the boot image and only give the choice to start a cmd.exe if so. Add the last 2 lines accordingly. Add a 'If' on the buttons shown and that's been taken care of as well. 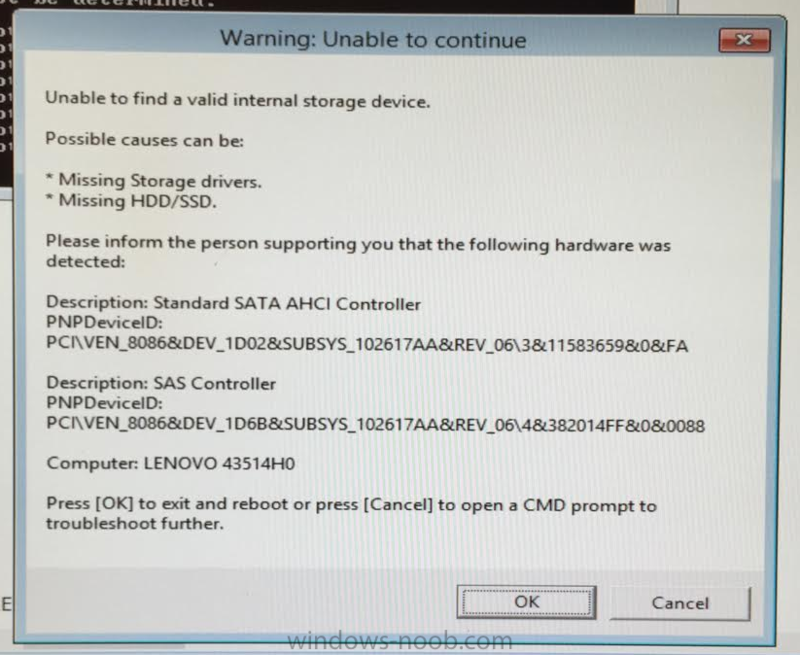 Message="Kunde inte hitta en hårddisk att installera Windows på." & vbCrLf & vbCrLf & " Meddela IT att detta kan vara orsaken:" & vbCrLf & vbCrLf & "* Saknar drivrutiner för hårddisken . " & vbCrLf & "* Hårddisken kan vara trasig. " & vbCrLf & vbCrLf & "Hårdvara: " & vbCrLf & vbCrLf & SataResult &"Dator: "& MakeModel & vbCrLf & vbCrLf & "Tryck [OK] när du är klar." 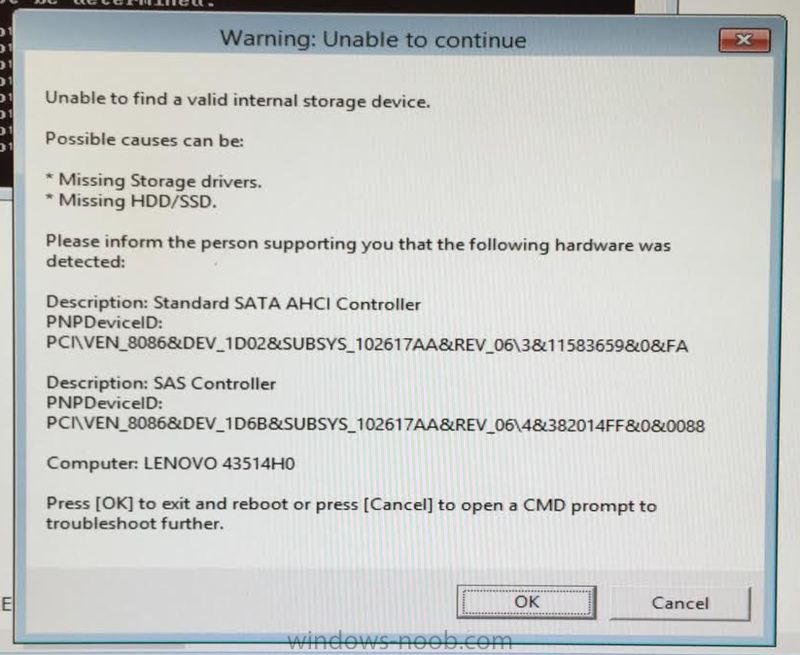 Message="Kunde inte hitta en hårddisk att installera Windows på." & vbCrLf & vbCrLf & " Meddela IT att detta kan vara orsaken:" & vbCrLf & vbCrLf & "* Saknar drivrutiner för hårddisken . " & vbCrLf & "* Hårddisken kan vara trasig. " & vbCrLf & vbCrLf & "Hårdvara: " & vbCrLf & vbCrLf & SataResult &"Dator: "& MakeModel & vbCrLf & vbCrLf & "Tryck [YES] för att få installationen att misslyckas eller [NO] för att starta en CMD-prompt." msgbox "When you are finished, press [OK]"
Edit: And of course calling the function early in the script.